I just love spring cabbage: the green loose leaves and the softer texture than autumn cabbage. While autumn cabbage is great for kaalilaatikko (Finnish cabbage casserole, which is my all-time most popular post, can you believe it :D), spring cabbage is better for this. The cabbages in Japan tend to be this spring sort all year round, while we can enjoy them until June-July perhaps (imported from Hungary, so are there any Finnish spring cabbages I wonder...). Maybe they can grow them all year round in Japan, so there can always be fresh newly-grown cabbages on the market? "Easy way" in the topic is not referring to making the food but rather to obtaining the ingredients (the easy way to make it would be to go to a Japanese supermarket, buy okonomiyaki flour, sauce and finely shredded cabbage (yes, they do sell it in plastic bags!!). It seems that lately I've been cooking foods from my previous posts (but that I already knew, as I tend to eat the same foods all over again). I've been eating okonomiyaki (my previous post about okonomiyaki here) nearly every day for the past week (excluding Midsummer) and still haven't gotten enough of it. Now I'm out of cabbage, so I haven't been able to make it. I've found that all-purpose flour spiked with dashi (or instant dashi granules) gives a tasty, authentic pancake. I don't know if okonomiyaki flour mixes have any raising agent, but I tried adding a spoonful of baking powder on the batter and it made the pancake lighter and fluffier. I also prefer using lots of cabbage and not so much batter, which also makes lighter pancakes in my opinion. I add batter only to the amount as to keep the pancake from crumbling. Okonomiyaki is sometimes called as Japanese pizza. I think it resembles more of a savoury pancake. 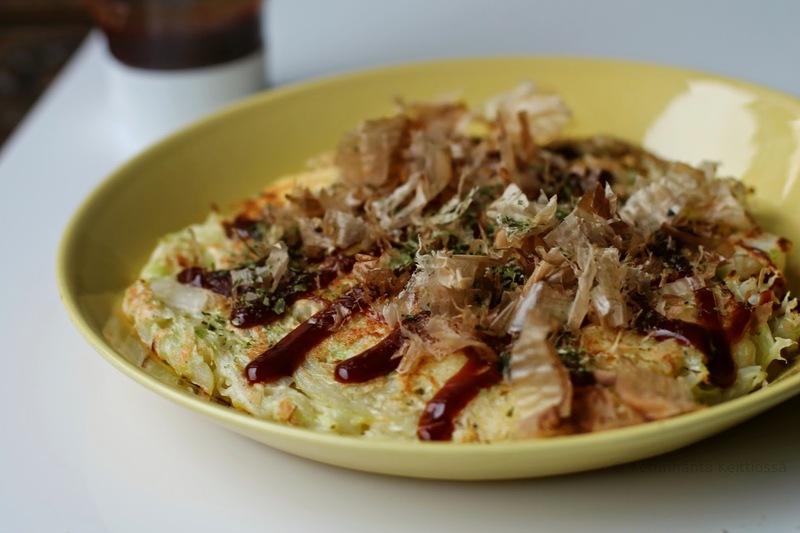 My first try on okonomiyaki was in my home kitchen years before I went to Japan. I hadn't even tasted it anywhere. I made it according to a recipe by Emi Kazuko and it involved cheese on top, which would make it seem like a pizza. I had forgotten all about using cheese in okonomiyaki as a substitute for pork belly. The cheese slices fry really crisp under the okonomiyaki and are a great alternative if you want to make vegetarian okonomiyaki. Using these ingredients you don't need any special ingredients. 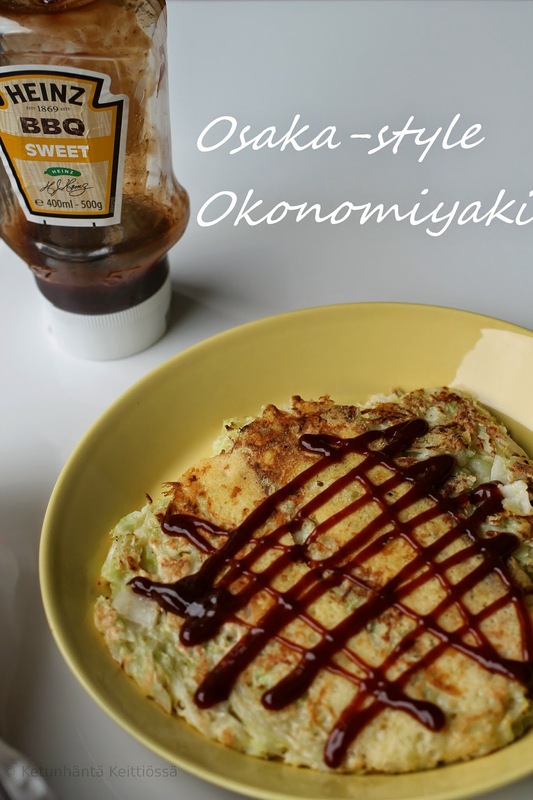 Even Heinz's sweet barbecue sauce works well as western "okonomiyaki sauce". I haven't really been able to figure how to substitute for bonito flakes which are an essential on my okonomiyaki but to some other they might not be that important (in one restaurant in Japan they didn't serve any bonito flakes at all). So consider the flakes optional, but you could try substituting nori flakes, which are much easier to obtain here in Finland at least, thanks to the recent years of sushi boom. This recipe is for the Osaka-style okonomiyaki (although probably I should have named this Finnish-style okonomiyaki). In Hiroshima version the ingredients are cooked in separate layers though they will eventually form one pile. my favorites are mochi (dense rice cake) in small cubes, octopus (tako) and calamari (ika). You can also add prawns or any other seafood, or even small pieces of tofu. 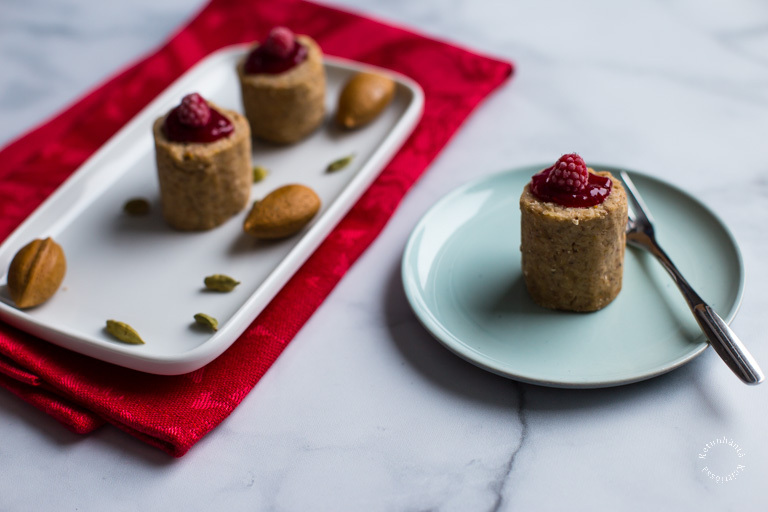 Mix the flour with dashi, (water), egg and baking powder. Add the finely shredded cabbage and sliced spring onion. Add fillings. Warm up a frying pan, grease with vegetable oil. Add half of the mixture, flatten it with a spatula to 1,5-2 cm thickness. Fry on medium heat for 3-4 minutes, until golden brown. Add a couple slices (cheese, pork...) on top and flip the pancake over (the slices will then be on the bottom. Fry for 3-4 more minutes and flip over when ready. Season with sauce, bonito flakes and aonori.